This is a bonus coupon from 28 Days of Snack and Save. 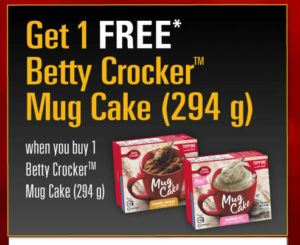 Get 1 FREE Betty Crocker Mug Cake (294 g) when you buy 1 Betty Crocker Mug Cake (294 g). Limit of one coupon per family.